This past summer, thanks to support from Creative Pinellas and the Pinellas County Board of County Commissioners, 52 campers a week at Great Explorations Summer Camp were able to participate in a daily art experience, explore the Dali Museum, and design a personal mola to decorate their very own rainsticks in a fantastic class with professional artist Cara Weaver. These experiences broadened horizons and deepened friendships as the children worked together to learn new things and express themselves in art projects that corresponded to each week's unique theme. When surveyed, 100% of the campers, when asked what activity from camp they still play with at home, indicated an art project they created in our Art-a-Day program. Some loved painting piggy banks and other loved sculpting their own boats, but whatever the activity, it's clear it made a lasting impression and is now an enduring part of the campers' lives. The Creative Pinellas grant funded our field trip to the Dali, which not only allowed our campers to immerse themselves into Dali's iconic surreal paintings, but it also helped make them aware of St. Petersburg's world-class art offerings. Finally, the opportunity to work with a professional artist really enriched the other activities we did during our Passport: South America theme. Many campers indicated that they feel they learned the most during that week, and we know that learning about rainsticks with professional artist Cara Weaver was a big part of that learning experience. Upon final reflection, the Creative Pinellas grant truly enhanced the hands-on, educational experiences that Great Ex campers had this summer, forming lasting memories and sparking curiosity and inspiring them to be lifelong learners. The Art-a-Day program that was funded by Creative Pinellas and the Pinellas County Board of County Commissioners added so much to our campers' experiences, providing many materials to explore and exciting creative projects to collaborate on. One of the other benefits of the funding was for the counselors, who got the opportunity to go beyond our normal camp crafts and activities to interact with the campers in different and often more profound ways. Finally, there was a great benefit to the organization, opening doors to deeper partnerships with other people in the community who are striving to create opportunities for creativity, self expression and broader horizons for the youth of today. Great Explorations is truly grateful for the gift of funding from Creative Pinellas - a gift that keeps on giving through deeper connections on both the micro and macro scale. We were so fortunate to have a great staff to guide and inspire our Great Ex campers this summer. Their skills, talents and experience helped create amazing educational experiences for our campers. Haleigh (pronounced like Sally) grew up in St. Pete and visited Great Explorations many times as a child; she loved it so much that she began volunteering here in high school. Haleigh graduated from UF in May with a degree in Elementary Education and is taking Master’s courses this summer and through the spring. She loves working with children whether it is reading stories, singing or doing arts & crafts. Jake (helping campers in the background of the above picture) fell in love with Great Ex when he began here as a volunteer in High School, and we loved how great he was in his work with the preschool children of Early Explorations Preschool! Jake attends college at Tulane University where he is majoring in Mathematics and Psychology. After graduation Jake plans to continue helping children as a teacher or child psychologist. In his free time Jake enjoys watching superhero and spy movies as well as supporting his favorite sports teams: the Bucs, Rays and Lightning. Amber is a native Floridian and proud graduate of Florida State University, where she double majored in Family and Child Sciences and Psychology. She formerly taught first and second grade in Manatee County and VPK at Early Explorations Preschool. During her free time, she likes to visit The Wizarding World of Harry Potter at Universal Studios with her husband and is an avid listener of Dave Ramsey. The week she was most excited about is “Life in the Reef” because she enjoys visiting Hope and Winter at the Clearwater Aquarium. Theresa (opening her arms above with her typical enthusiasm and energy) is a Tallahassee native, and was excited to return to the Florida sun after 4 years of living in busy NYC. She has been teaching and empowering children in schools and hospitals for the last decade. With a degree in Education and an understanding of the true value of play and expression, she cannot wait to spend the summer encouraging young explorers. She has an undeniable love for silly songs, sound effects, dancing, Disney, Harry Potter, chocolate, traveling and sloths! Mr. Micah is a Great Ex celebrity as School’s Out camp counselor and a staff member on our gallery floor. We were very happy to have him back in town and educating children in our camp program this summer. Micah plays football at Ana Maria College and will graduate next spring with his Bachelor’s degree in Social Work. Micah plans to complete a Master’s degree program with a focus on Social Work before beginning his professional career working with children. In his free time he enjoys playing video games and spending time with his mom. Camp Director Lauren enjoyed her fourth summer at Great Explorations. Lauren has a degree in Psychology, and is a Pinellas County native. In addition to leading the summer camp program Lauren is also responsible for Great Explorations After-School, School’s Out Camps and Parents’ Night Out programs. When not at the museum Lauren enjoys paddle boarding and beach cruising through St. Pete. Summer Camp was made possible with the support of Creative Pinellas and the Pinellas County Board of County Commissioners. Making friends is such a special part of camp. Our short, fun summer is over. Even though Great Explorations stays busy with our year round Early Explorations Preschool, our Stay & Play after school program and general museum visitation, with camp over we have had a moment to reflect on all of the exciting exploring and discovering we did together this summer. As you know from reading this blog, our young explorers had amazing experiences both at the museum and on our weekly field trips. Our campers also have daily play time in the museum's hands-on exhibits, and these everyday moments are another thing that makes camp at Great Explorations such an energizing and creative experience. Free time is an opportunity to get creative and get to know each other better. Our camp curriculum also allows for campers to choose activities to do during quiet time. With the support of Creative Pinellas and the Pinellas County Board of County Commissioners, we are able to offer materials that allow creative expression, teamwork, and the opportunity to develop skills and make memories to last a lifetime. Stay tuned next week for a collection of highlights and feedback from campers and counselors! Campers at Great Explorations had so much fun exploring different careers this week. Counselors paired each profession with an arts and crafts project, helping campers create memories and mementoes of their week at camp! The first day of school is right around the corner, so campers explored the noble profession of teaching and decorated pencil boxes. Teachers and students are getting their supplies ready for a great school year! Learning about careers led to conversations about money so campers painted piggy banks! Our two walking field trips allowed campers to explore the neighborhood as well as what it is like to be an artist or a chef. Campers painted their own masterpieces at Practically Pikasso. We can't wait to see what the plates look like when they come out of the kiln! Campers learned about being chefs and decorated a standard tool of the trade. Every chef needs a beautiful tray to serve goodies on! Campers got a hands-on, mouths-on experience during a walking field trip to Carrabas. Campers create edible art on their pizza dough canvases. Now that's an oil painting! Campers enjoy the "fruits" of their labors (tomatoes are a fruit, right?). It was a wonderful last week of Summer Camp at Great Explorations and we are so grateful for the support of Creative Pinellas and the Pinellas County Board of County Commissioners! A cowboy prince tends to his castle. Enjoy the Alice in Wonderland cover re-interpreted in watercolors by one of our 4 year old campers. Campers used feathers, tissue paper, sequins and other materials to decoupage their storybook boxes. We enjoyed the iconic Great Ex program, Global Groove to explore telling stories with music and movement. The highlight of the week for the campers and counselors was a trip to the Dali Museum. Our older campers loved the audio tour and the younger campers enjoyed learning about this fascinating art from their counselors. And what a treat to explore the gorgeous building and grounds - what a local treasure! Campers enjoy the decoration of thousands and thousands of wristbands from previous visitors. Once upon a time, a hands-on museum hosted educational camps in a beautiful city by the Bay. The happy campers made friends, created memories and explored the art and science of fun and learning. This week campers at Great Explorations dove into the world of fairy tales, folk tales, stories told in pictures and stories told through music. It was an amazing week filled with curiosity, adventure and discovery. Magic flowers have special powers! Our youngest campers really put a lot of thought into their watercolor work. Campers had the chance to work with many different ways of telling a story. They decoupaged their own storybook boxes, let their imaginations go wild with scratch art and even explored vivid colors and luxurious textures with velvet art! The sensory experience of getting sticky is part of the beauty and challenge of making art! Scratch art and velvet art added to the fun this week. Campers found so much to discover in Dali's The Discovery of America by Christopher Columbus. Five happy Great Ex campers at the end of yet another amazing experience with art and culture. This happily ever after is possible with support from Creative Pinellas and the Pinellas County Board of County Commissioners. Stay tuned for "When I Grow Up..." the grand finale to Summer Camp at Great Ex! Campers at Great Explorations Children's Museum this week grabbed their passports and headed to South America! They explored the sights, sounds, flora and fauna of this fascinating continent through a variety of experiences, and with the help of a special guest artist, they even made it rain!!! 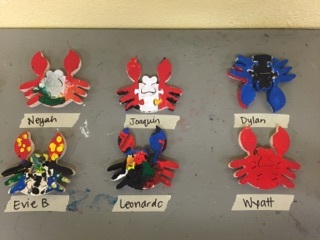 Campers enjoyed real life animal encounters at Boyd Hill as well as crafting fanciful sticky board creatures. After learning about the amazing structures of South America, campers were inspired to build their own! Campers learned about the use of natural materials like hollowed out cacti, dried cactus needles and pebbles in the making of traditional rainsticks, and then enjoyed putting their own together by filling tubes with rice and dried beans and wrapping them with their own molas. The highlight of our week was the visit from Creative Clay artist, Cara. Under her direction, campers used liquid chalk markers to draw molas that would eventually decorate their rainsticks. We extended the lesson on using natural materials in traditional art forms by dyeing cloth. It was an all-hands-on- deck activity, so we didn't manage to get any pictures, but we did manage to make a wonderful mess and even better memories! What a fine mess we're in! Our littlest explorers had a messy, fun, sensory experience drawing on a shaving cream canvas. From wonderful messes to joyful noises! Great Ex campers also made and decorated their own tribal drums. The smiles and creative energy above are possible with the support of Creative Pinellas and the Pinellas County Board of County Commissioners. Next week's theme is Once Upon a Time and a field trip to the Dali Museum! This week campers at Great Explorations were super sleuths studied fingerprints, honed their senses and were tasked with solving many mysteries, including finding the missing shells at Fort De Soto Park. Campers used powers of observation to identify shells during a shell scavenger hunt. Even the smallest details can help solve a mystery, so our detectives got "printed" and learned about fingerprints and how studying them can help solve mysteries. Detectives use their senses to solve mysteries so our campers had a sensory experience with super slime! This proud sleuth had fun in the sun finding the mysteriously missing shells at beautiful Fort De Soto! Meanwhile back in the museum, campers started the week making secret agent backpacks. ...while others preferred to design them freestyle. Campers thought it was so cool that each fingerprint is unique! Creating and unveiling secret messages was a really fun part of Super Sleuth Academy. Campers used white crayons to create their own secret messages and unveiled them with watercolors, learning about wax and watercolor resist technique. After a week of solving puzzles, campers had a great time designing their own personal puzzles! Campers expressed themselves by drawing on foam with permanent markers. After a quick trip through the AccuCut machine, their beautiful drawings are now puzzles to take home and solve! At the end of the week the mystery was solved - Great Ex camp is loads of fun! The amazing fun and educational experiences are possible with the Support of Creative Pinellas and the Pinellas County Board of County Commissioners. Grab your passports - next week we are off to South America! Campers had a "hands-on experience" with Mother Nature while on a field trip to the Pinellas Solid Waste Management facility! This week's theme was Planet Pals and campers at Great Explorations explored the earth and the sun, the weather, our natural resources and recycling. Campers explored color and patterns while picking out beads for a bracelet. Nanoparticles in the dye change shape (and therefore color) when exposed to ultraviolet light. While our daily rain showers sometimes interfere with our outside activities, they also help things grow. Campers prepare a mystery grass craft. Hmmm. What do you think it will be? They created homemade chia pets!!! They are so excited to watch them grow "hair!" Stringing beads took lots of patience and concentration. Finally it was time to add very special UV-reactive beads to their bracelets. Not only are they cool and beautiful, but they also will help keep campers' skin safe. When the beads change color in the sun, the UV rays are strong enough to burn their skin - time to apply sunscreen or cover up! Even in the Sunshine State we see a lot of different kinds of weather. Campers made weather wheels to keep track of what weather they observed each day. Speaking of pets, they are an important part of our planet too! Campers made plant and animal mosaics. Campers used tiles made up of images of plants and animals to create nature-themed, earth-tone mosaics. Our four year old campers were so proud of the garden-themed pinwheels they decorated with markers and foam shapes! The campers' exploration of wind started with decorating wooden garden-themed pinwheels and then tied in to the presentation from Pinellas Solid Waste Management as a way to start understanding wind as a renewable energy resource. Decorating pinwheels with permanent markers. As you can see, campers at Great Ex have a lot of opportunities to be creative, express themselves, and have fun, whether it's in the classroom or in the museum! Yellow and blue make green...but what do yellow and green make? They make some really cool glasses! The creative fun and learning at Great Explorations Summer Camp is possible with the Support of Creative Pinellas and the Pinellas County Board of County Commissioners. Stay tuned next week for Mystery in the Museum! Week 3 - America the Beautiful! This week campers at Great Explorations went on an imaginary adventure across the United States! It was a great opportunity to share travel stories and explore the many different landscapes of America the Beautiful! An exploration of America wouldn't be complete without America's favorite pastime, so campers designed their own baseball helmets and even went to a Rays game! During our investigation of landscapes campers of all ages got very creative, using basic materials like blocks and crayons to create their own scenes. Our older campers got excited about city skylines. Thankfully campers stayed pretty calm while they did sand art, but once we got to the Wild West, they went cowboy crazy! Campers were ready to giddy up with their Texas-themed bandanas. ...and allowed them to share their own travel experiences. Our youngest campers were inspired by colorful landscapes. But we didn't stop with basic materials! You can't study the beach without sand or Texas without a bandana, right? Our young campers explored colors and textures as they very carefully poured colored sand into bottles. Older campers used geo boards to create unique "photographs." Is it a bright Florida sun? Or a ferris wheel from one of America's famous state fairs? After our "trip," our campers had so many wonderful memories so we made hand-painted picture frames! Campers hard at work creating the perfect frame for their road trip memories! Finally, we got ready for the holiday weekend by coloring our very own U.S.A. beach balls! Stay tuned for next weeks adventure - Planet Pals! A camper adds some bling to an octopus, helping it blend right in with its colorful surroundings. Lobsters, and fish and crabs - oh my! Campers at Great Explorations went under the sea to investigate reef creatures and habitats this week. Our arts and crafts this week really highlighted the beauty, colors and diversity of life in a coral reef. Our campers explored light and color while painting stained "glass" underwater scenes. Our youngest campers got in on the fun making adorable collage bookmarks with their favorite reef residents. They listened to ocean-themed stories to inspire free-style drawing, and made pencil holders with colored sea scenes. Our young explorers made a wonderful, joyous mess painting ceramic fish boxes. Parents appreciated the beautiful and useful gifts we sent home (and the mess that stayed at Great Ex!). Campers investigated how an animal's physical characteristics aid in defense and survival. What better way to explore why fish are shiny than by creating a CD fish? These shiny, reflective fish would dazzle a predator, don't you think? Submarine scratch art was a fun activity for our younger campers too! This colorful and creative week for our campers was possible with the support of Creative Pinellas and the Pinellas County Board of County Commissioners. Stay tuned next week as we go on an imaginary road trip across America the Beautiful! Our youngest campers proudly show off their colorful hot air balloon collages. Campers at Great Explorations Children's Museum explored planes, trains, automobiles and all things that go (including hot air balloons!) during their first week of camp. Our older campers started out the week designing boats then building them out of clay. They then painted them throughout the week. Of course they loved the opportunity to get messy and creative with clay and paint! The early stages of a boat designed by a camper. It was so fun to see all of the personal touches that our campers put into decorating their wooden planes. We had some fascinating conversations about history and famous aviators during this activity. Can you spot the Red Baron? With the Support of Creative Pinellas and the Pinellas County Board of County Commissioners, Great Explorations can provide unique and interactive art and design experiences to St. Pete's young explorers. Stay tuned for Life on the Reef next week! Summer Camp 2016: The Art-A-Day Initiative - The summer camp will be enabled by the grant to incorporate field trips and additional art classes by local professional artists and will provide art materials to campers so they can participate in an art project each day as related to the weekly camp theme being explored.